Bespoke Sauce Manufacturing – What Type of Businesses Do we Supply? Quattro Foods is one of the leading sauce manufacturing companies in the UK. Our team of experienced chefs use the best ingredients and put their heart into every sauce. From spicy to sweet, from fiery to fragrant, every combination of ingredients is designed to achieve the ultimate taste sensation. 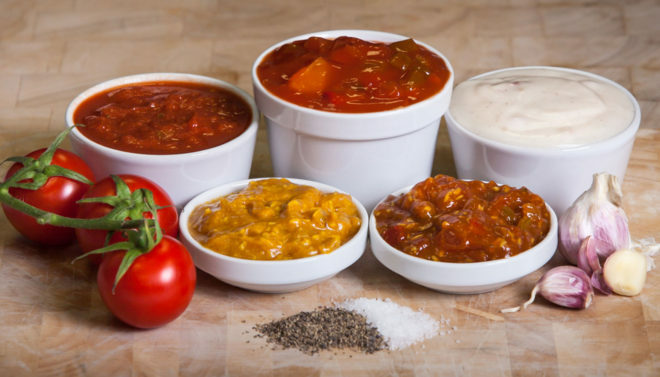 Quattro Foods creates top quality, wholesale and retail sauces for foodservice providers, who in turn supply high street chains and individual restaurants. With two distinct types of provision, we supply the market with a range of both bespoke sauces for our direct clients and our popular chefs’ ingredients range designed to be sold in bulk to the foodservice industry. It’s the supreme taste and incredible convenience of our products that ensure our happy customers come back to us time and time again. Our skilled chefs dedicate themselves to sourcing the best ingredients in order to create stunning flavours and mouth-watering sauces. The businesses we supply include foodservice companies, who sell the sauces to high street cafes, restaurants, shops and retailers. This means that Quattro Foods’ premium products can be found all over your local high street! We serve the wholesale sector with bulk quantities, although smaller orders are also available on request. Some of our customers are served directly with bespoke sauces, created for their individual client base. Our range of sauces creates a vibrant mosaic of colour, aroma and texture. Made with premium ingredients, our diverse concoctions include Volcano Chicken Sauce, Herby Tomato Sauce, Nepalese Curry Sauce, Beef Chilli Sauce, Lamb & Mint Ragu, Pad Thai Sauce and an ever increasing selection of tasty, colourful, authentic and convenient sauces to accompany meat, fish, chicken, vegetables and salads. For customers with an exotic palate we supply bespoke spicy international sauces including Enchilada sauce, Creole Sauce, Tennessee Sauce and Mexicana Hot Sauce, amongst many others. For a more European feel, order a delicious selection of delights with an Italian twist. From mouth-watering Ragu to Sausage & Sage, we bring a taste of Italy to the high street. Buonissimo! Designed by chefs for chefs, our priorities are consistently outstanding taste and convenience. As one of the UK’s premier sauce suppliers we supply convenient and delicious sauces for restaurants, wholesale businesses and retailers. Designed to save time in large and busy kitchens, our ready to use range is the ideal solution for chefs looking for premium taste without having to source ingredients and cook the sauce themselves. Created to the highest standards, these sauces are good value alternatives to fresh sauces. Our vast selection includes Spicy Salami and Pomodoro Sauce, Herby Tomato and Chorizo Sauce, Refried Beans and Kansas Sauce, as well as hundreds of further variations on seasonal and year-round ingredients for a variety of food types and clients. Using traditional preparation methods in nut-free, state of the art kitchens, Quattro Foods’ chefs are experienced, skilled and knowledgeable in the art of sauce making, building upon the company’s reputation as the sauce company the UK relies on.